It is reassuring to know the spirit of exploration is still alive and well at NASA, but it is frustrating to see the agency’s procurement problems also continue unabated. A gutsy expedition will attempt to make a punishing 2,000-mile journey across Arctic ice that simulates conditions on Mars, but their vehicle does not inspire confidence in Jean-Christophe Jeauffre’s documentary Passage to Mars (trailer here), which opens this Friday in New York. 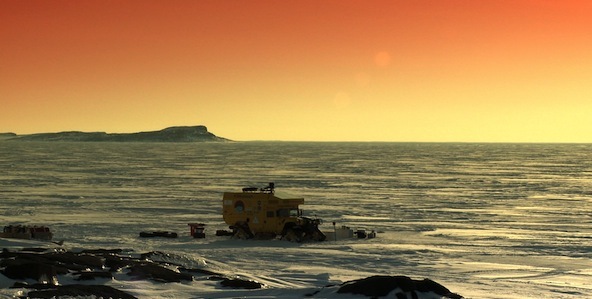 For the HMP Okarian Martian Rover Humvee, the trek over frozen and thawing ice to the NASA station on Devon Island is the closest thing to a dress rehearsal for a manned mission to Mars. For the crew led by NASA scientist Pascal Lee, this might be the closest they get to Mars. Unfortunately, malfunctions will repeatedly jeopardize their terrestrial journey. By combining his fly-on-the-wall footage with extracts from Lee’s journals narrated by rebooted Star Trek actor Zachary Quinto, Jeauffre vividly conveys the desolation and extreme climate of the Arctic Journey. The film also clearly establishes its applicability to the wider Mars project. However, it does not explain why the project is so wedded to the Okarian Rover, especially considering the frequency with which crew members have to set off for civilization in search of spare parts. Presumably, that would not be an option on Mars. It makes you wonder in whose congressional district was it built? It is not an idle question. Aside from our interest as taxpayers, the Okarian’s performance also raises safety issues for a prospective crew. Yet, rather bizarrely, Passage does not even acknowledge this as an issue. Perhaps Jeauffre and his subjects were understandably more preoccupied with matters of survival, which were very real concerns. Indeed, Jeauffre captures some amazing images and compellingly documents the courage and commitment of the Okarian crew. Frankly, the real stuff is more impressive than the planetarium show-style Mars recreations (but don’t worry, it is not in exploitative 3D). For extra added authenticity, Apollo 11 astronaut Buzz Aldrin also lends his voice to the proceedings. Arguably, Passage is a needed corrective to the tiresome conspiracy theories recycled yet again in Operation Avalanche. Like the Apollo, Gemini, and Mercury astronauts before them, the Okarian crew are both idealists and adventurers who inspire by example. 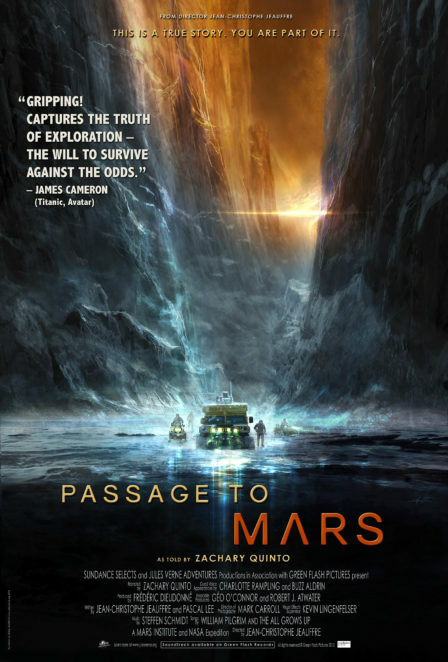 Recommended for those who will appreciate its science and optimism, Passage to Mars opens this Friday (9/30) in New York, at the IFC Center.